Harold L. Hoeferle, 81, of Normal, passed away peacefully in his sleep at home on February 2, 2019. His funeral will be at 10:00 a.m., Saturday, February 9, 2019 at Epiphany Catholic Church, Normal with Monsignor Eric Powell officiating. Burial will be in Park Hill Cemetery, Bloomington. Visitation will be from 4:00-7:00 p.m., Friday, February 8 at Carmody-Flynn Funeral Home, Bloomington. Memorials can be made to Epiphany Catholic Church, 1000 E. College Avenue, Normal, Illinois 61761, the Bloomington YMCA, 602 S. Main St., Bloomington, Illinois 61701, or Milestones Early Learning Center (formerly Daycare Center of McLean County), 1207 Six Points Road, Bloomington, Illinois 61701. Harold was born September 6, 1937 in Akron, Ohio to Paul R. Hoeferle and Lydia E Anderson Hoeferle. He was preceded in death by his parents and two brothers, Paul L., Crawfordsville, Indiana and Gerald L, Hoffman Estates, Illinois, and two brothers-in-law, Larry Horner, Keokuk, and Dan Pope, White Cloud, Michigan. His early family life was spent in Keokuk, Iowa where he attended Iowa schools. He was a graduate of Southeastern Iowa Community College and later the University of Wisconsin Graduate School of Banking. He was a member of the Iowa National Guard. He married Nancy Horner Hoeferle September 24, 1960 in Keokuk. He pursued a career in computers at Shellor-Globe, Keokuk, Keystone Key and Wire, Bartonville, Illinois, and Arnold Engineering, Marengo, Illinois. In 1967, they moved to Bloomington, Illinois to establish a computer system for the then People’s Bank of Bloomington, now Commerce Bank. People’s was the first financial institution in town to have a computer. After successfully starting the data processing center in the bank, he assumed several positions in the bank including president. In 1980, Harold purchased Weaver & Associates Property Management, and in 1985 changed the name to Apartment Mart with a move to 912 N. Linden in Bloomington. He continued his interest in banking serving on several bank boards through the years. He was a charter member of Epiphany Catholic Church and a Eucharistic minister for many years. 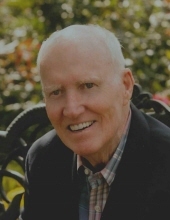 He was an active member of the community serving on several boards. He is survived by his wife, Nancy, a daughter, Kristi L. (Jeff) Hunt and a son, Kurt L. (Ronda) Hoeferle; five grandchildren including Lauren and Brian Hunt, and Brooke, Natalie, and Ryan Hoeferle , all of Bloomington; sisters-in-law Phyllis (Jerry Dulski) Hoeferle Dulski, Antioch, Illinois, Charlene Hoeferle, Crawfordsville, Indiana, Suann (Wendell) Guthart, Davenport, Iowa, Sandra Pope, Holly, Michigan, Bonnie Horner, Keokuk, Iowa, and brother-in-law Kenneth (Pam) Horner Jr., Keokuk, Iowa; plus several nieces and nephews. He felt family being close was a tremendous blessing, and they were an endless support in later years to him. Harold had a strong passion for golf and enjoyed it for many years at Lakeside and Bloomington Country Club with his competitive nature. He established the grandparent –grandchild for both sexes in city tournament play. He had a part in establishing the Links of Ireland Grove golf course which allowed him to enjoy another interest he had in trees. He chose the trees for the course and loved watching them grow. He also enjoyed gardening, planting, and a manicured lawn. He enjoyed sports, especially following Kurt’s choices in high school. He shared Kristi’s love of horses from a distance and encouraged her passion. He did stained glass in his spare time. He and Nancy loved to travel with friends and cherished these memories. He loved the ocean and for many years the whole family traveled to Mexico and the Caribbean to enjoy snorkeling and the beach. These trips were a huge highlight in his life as he saw each grandchild grow to share his love of the ocean. Family meant everything to him and he treasured his long marriage. He welcomed the addition of Ronda and Jeff to the family with the marriages and appreciated greatly the constant support, fun, and blessings they added. He was affectionately called Papa and loved every minute of a family gathering. His grandchildren were truly a bright spot in his life and he delighted in following their activities. They all knew his religious side and teasing ornery moments. Harold was a man of strong faith and he loved to share it. He appreciated honesty, loyalty, his long friendships, and the camaraderie it brought to his life. He enjoyed being generous to others. His strong will, strong handshake, contagious smile, and never doubting God’s will mixed with a tremendous sense of humor served him well to the very end. The family would like to thank everyone for their long dedication to caring for Harold especially Dr. Pilcher, Dr. Leak, Dr. P. Naour, Poonam McAllister, Hawkins Williams, Brandon Miller, Karen Gustafson, and Advocate Hospice. Thanks to his loyal business partners Don Franke, Darren Rogers, and Chris Holloway. A special thanks to the guys at the monthly golf meeting at our house and for being such loyal friends as you relived his golf days and stories for years. And we offer sincere gratitude to all our dear friends and neighbors for their continuous love and support for so many years and all the awesome people who brought food in so generously and faithfully for so long. "Email Address" would like to share the life celebration of Harold L. Hoeferle. Click on the "link" to go to share a favorite memory or leave a condolence message for the family.